Both of these were created by the talented Kathy Wade. Happy Thanksgiving, everyone! See you out on the town. “Easy Ed’s Variety Hour” is in the shop for routine maintenance. (The show was long overdue for a patter change and a rotation rotation.) Thus there will be no broadcast this week. I’ll be back on November 28, the day after Thanksgiving, with a lot of upbeat rockin’ and boppin’ numbers to help you work off the gravy and stuffin’. In the unlikely event that you really need to hear a show this week, you can check out one of the archived broadcasts at http://www.easy-ed.net/. Tomorrow night, November 19, I will be DJing live at River Gods in Cambridge as part of their ongoing Primitive Sounds series. I want to thank Jason Beek, P.J. Eastman, and the good folks at River Gods for the invitation. Please stop by! The music starts at 9:00 PM. 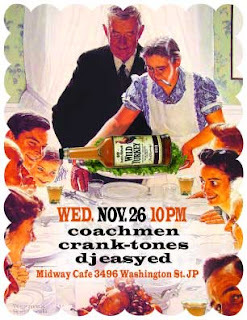 On November 26 (Thanksgiving eve) don’t miss the exciting battle-of-the-bands grudge rematch between the Cranktones and the Coachmen at the Midway. I will be spinning from a safe distance before the bout and between rounds. 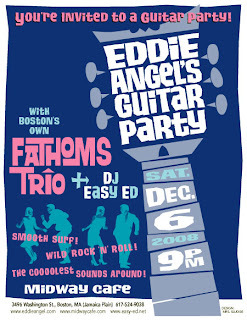 December 6: You’re invited to a guitar party at the Midway with Eddie Angel’s Guitar Party, Boston’s own Fathoms Trio, and DJ Easy Ed. No need to RSVP. Just come on out for some rip-roarin’ fun! 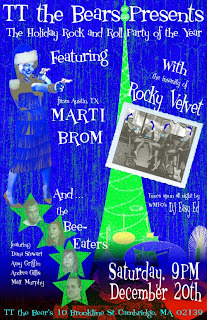 December 22: There's gonna be a great big holiday show at TT the Bears in Cambridge, starring Marti Brom, Rocky Velvet, and Dana Stewart's brand new jump blues band. Yours truly will be spinning as well. This promises to be a fantastic evening of entertainment. 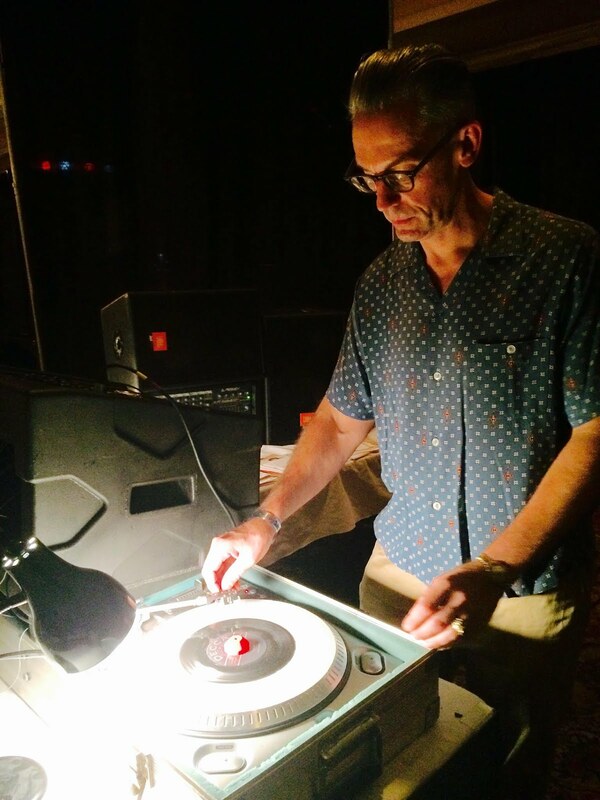 I want to thank everyone who came out to the Eric Laufer benefit at the Midway last Saturday night. The show was a great success and we were able to raise a good sum of money to pass along to Eric’s family. Thank you to all the bands, who worked really hard to put on a fantastic show; everyone who generously donated items for the raffle; the Midway Café, for hosting the event; and everyone who came to the show. Thank you all! !